Split Box Springs are used when the size of a standard box spring is too large to fit up the stairs or into your bedroom. Includes 2 Box Springs that measure 30 in. x 80 in. x 7.5 in. each. The two pieces combine to make a Queen Size Box Spring. Split Box Springs require at least one center support bar. Need a Center Support Bar? Box Springs are designed to cushion the Mattress against the weight of your body making your Mattress last longer. These Box Springs contain a light hoover interlocking metal spring system made by Leggett and Platt. The outer fabric is a long wearing high quality damask. 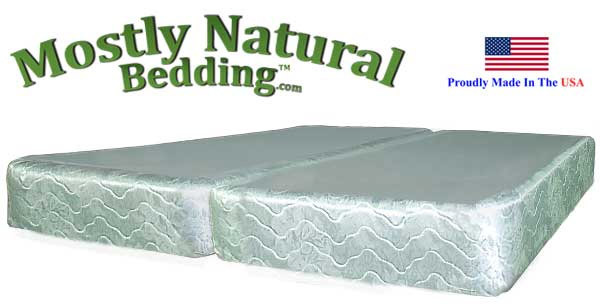 These Split Box Springs meet or exceed the flammability standard FF4-72. In Stock - Please allow 3 business days to ship, plus a few days in transit. Ships via curbside Freight Delivery. We will email tracking info as they ship, The local delivery carrier should call to arrange a delivery appointment. If you need inside delivery please call us for a quote. Set of Queen Size Split Box Springs.